It is said that the face hangs from the eyebrows, and that is a statement that illustrates the striking framing a well-groomed brow can take. Whether it is for a special event or for everyday at the office we all like to look our best and for many of us one of the first things we tend to is our brows for this very exact reason. Microblading allows as the freedom to attain the perfect shape. 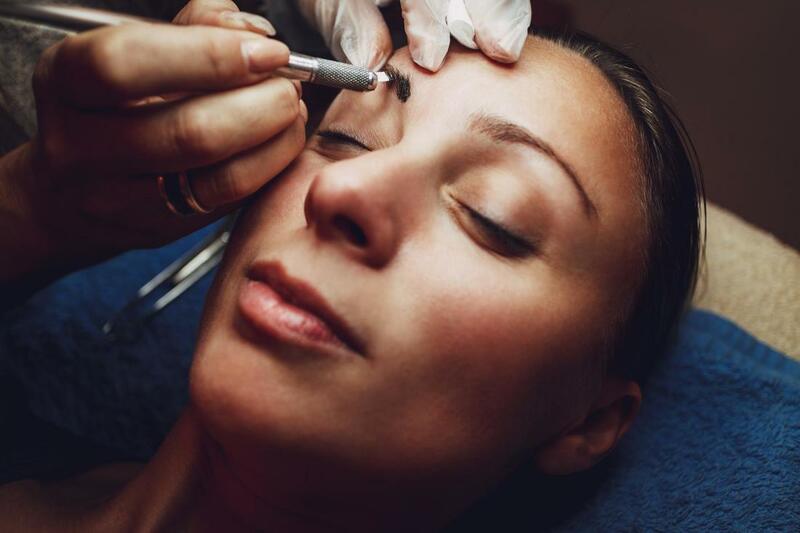 Whether we have too little hair or uneven arches, microblading molds the brow to the contours of our face in a way that best flatters your features. Microblading is for anyone that wants a more permanent naturally thick looking brow shaped to a style that compliments their individuality and their bone structure. Naturally with aging our brows tend to thin out. Also over plucking and waxing too much can thin the hairs and leave our brow looking sparse. Filling our eyebrows in with pencils can be beautifully done, but sometimes we desire that no make up look. With the fine hairs microblading simulates the natural look of the brow is unbeatable. Microblading can also elongate your brows or assist in defining more volume and texture for a naturally thick brow. Most eyebrow enhancing treatments, whether it is a pigmented gel, a growth serum, or a wax with a tint none of them have the permanent staying power that microblading achieves. Microblading is a cosmetic procedure conducted with a small hand held tool that has a needle finer than a tattoo needle. Our microblading specialists guide this needle in and out of the skin drawing micro strokes with ink that simulate natural hair. Microblading is technically a type of cosmetic tattoo, however the pigment is not as rooted in the skin as a regular tattoo. This application which results in a flawless brow will last anywhere from one year to three years. As mentioned before microblading is a permanent application. No more running to the drug store every couple months, or going to the salon every three weeks. The results from microblading last several months if not years. Maintenance for this cosmetic procedure is absolutely minimal. Unlike applying eyebrow pencils or gels daily, or even going every three weeks to get an eyebrow tint, with microblading you will only need a touch up once a year. Dependent on age or skin type it could be even less. Not only does microblading manage excellence, it also is huge time saver for you. Thicker hair is one of the number one indicators of health and youth. This includes the eyebrows. With microblading adding extra hair and shaping your brow to be a luscious frame for your face it will take away years from your appearance. Thicker hair revitalizes anyone’s look. Our professional team here at I-Brauhaus NYC knows just how to compliment your natural beauty with the appearance of natural thick hair that microblading flawlessly produces.